See That There: time for a new rug! time for a new rug! I hate rug shopping, but we knew for a long time that our rug was way too small and very uncomfortable. It's a rug from Flor and we love that we designed it ourselves, but it was beginning to come apart in some places and the thinness of the rug was getting uncomfortable. 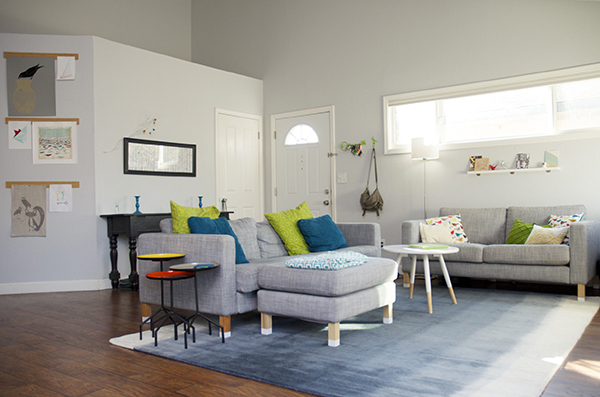 The most awesome thing about Flor rugs is that you can arrange them in any shape! So we might use our rug as a runner for the hallway! We wanted something a little more plush. I've had my eye on quite a few rugs from West Elm and CB2 and I was having a hard time picking one. On top of picking what we liked, we had to consider our cats. 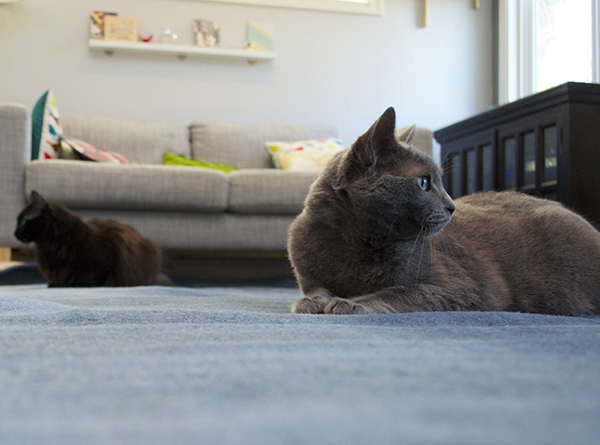 The cats would definitely puke on the rug at some point (it wasn't if, but when) and they enjoy scratching their claws against certain textures. So hand knotted rugs and jute were out of the question. 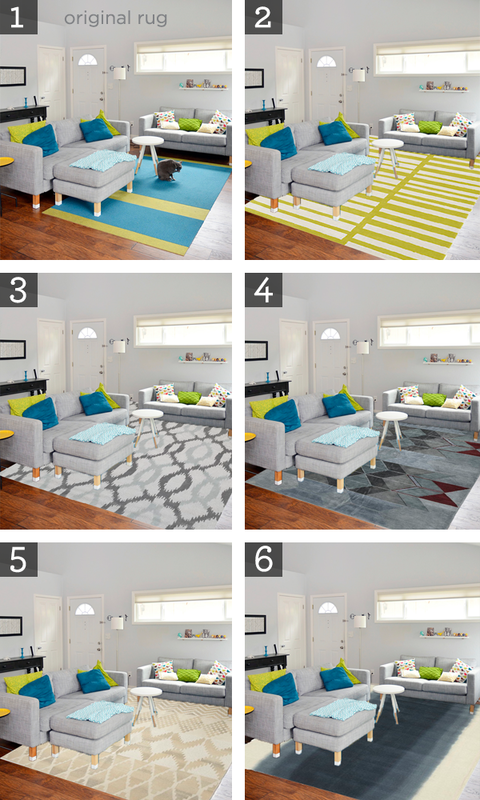 So I photoshopped some rugs to get an idea of what they would look like. I can't stand tan, but I even considered a tan rug, because I love that pattern so much! In the end, I decided against it because it just wasn't enough color. One of my favorite rugs is that bright green CB2 keys rug, but all my rugs have had some sort of green stripe in them and the keys rug had a ton of white. Which is a bad idea for most people, let alone someone who has cats. So I forced myself to try something different. I finally decided on the Ombre Dye Rug. I chose it because it wasn't geometric (I always choose geometric shapes) so this is something different, and the colors will be more difficult to stain (except for the white edges.) Also midnight blue works with all colors, and doesn't clash with my bright green and teal pillows, which I want to keep for now. The rug is shedding right now, but I've read that you have to wait a few months for the shedding to stop. If it doesn't stop though, I think I may have to exchange it for something else. And the cats love it too! Here they are trying it out when I first unrolled it.